As we discussed last week, every football coach is forced to change course as their season goes along. No team has ever seen every idea or scheme taught in August work perfectly in December or beyond, and the 2014 Buckeyes were no different. However, it's the way coaches and players respond to these failures that often separate championship teams from the rest. First year coordinator Chris Ash was brought in to lead a unit that had been plagued by inconsistency in Urban Meyer's first two years in Columbus. He was joined by long-time Penn State assistant Larry Johnson, who looked to continue his successful string of producing NFL talent on the defensive line. Along with holdovers Luke Fickell and Kerry Coombs, this group of coaches were able to turn a unit that consistently surrendered big plays in the past into a top-20 unit nationally. But perhaps more impressively, these four were able to shut down the three Heisman trophy finalists in consecutive week on their way to the National Championship, a feat never before seen in college football. But their journey wasn't seamless. Much as their counterparts on offense had to adjust to critical personnel losses to go along with opponents consistently attacking a perceived weakness, the Ohio State defense had to make important changes throughout the year. The Silver Bullets had always planned on having a defense led by a dominant front line, banking on contributions from returning second-team all-Big Ten defensive tackle Michael Bennett, as well as former five-star recruits Joey Bosa, Adolphus Washington, and Noah Spence. After seeing Washington and Bosa split playing time the year prior, Johnson had to come up with a way to get both on the field at the same time. Though senior nose guard Joel Hale was returning, Johnson and the coaching staff made the decision to move Bennett further inside to play over opposing centers at the nose, with Washington adding bulk to move to Bennett's former spot at the "3-technique" tackle. Though both defensive tackle spots appear similar on the surface, lining up on the interior of the line and fighting off the blocks of opposing offensive linemen, the spots can be quite unique. In some defenses, such as the one Ash led previously at Arkansas, the two defensive tackles would always line up as the right or left tackle. The pair would then split the responsibility of lining up in the "A gap" between the center and guard, otherwise known to coaches as a "1-technique" depending on the play called. 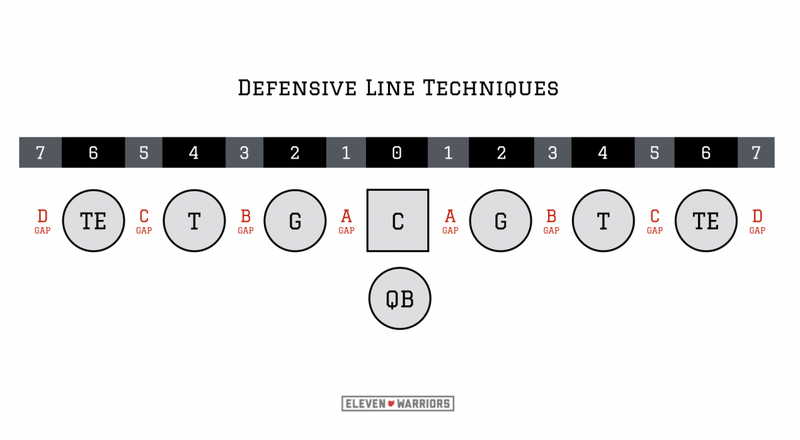 Johnson and Fickell, the co-coordinator of the unit, prefer making one man line up at nose consistently though, allowing each tackle to master the skills necessary to be successful at their spot. This meant that both Washington and Bennett would effectively have to learn a new position, with Washington also needing to gain additional weight to hold up in his new role inside. But the Buckeyes were dealt a major blow when Spence was suspended for the year after failing multiple drug tests. While the simple answer might have been to leave the tackle spots alone and let Washington and Bosa man the end spots, the group had all spent the entire spring and summer training and practicing their new spots. Hale, in particular, wasn't even in the same meeting room as this group anymore, having made the move to offensive line to help fill the void left by four starters on that side of the ball. The Silver Bullets would have to rely on their existing plan of Washington and Bennett inside, and hope that seniors Steve Miller and Rashad Frazier could fill in at Spence's vacant end spot. As the season began, the Buckeyes appeared to have made the right choice, with only the triple-option attack of Navy averaging more than 4 yards-per-carry on the ground through their first five games. At the same time, Joey Bosa was busy making a national name for himself after registering three sacks, three forced fumbles, and seven tackles-for-loss in that stretch. But for NFL talent evaluators the real story was Bennett, who seemed to be struggling to live up to the hype. 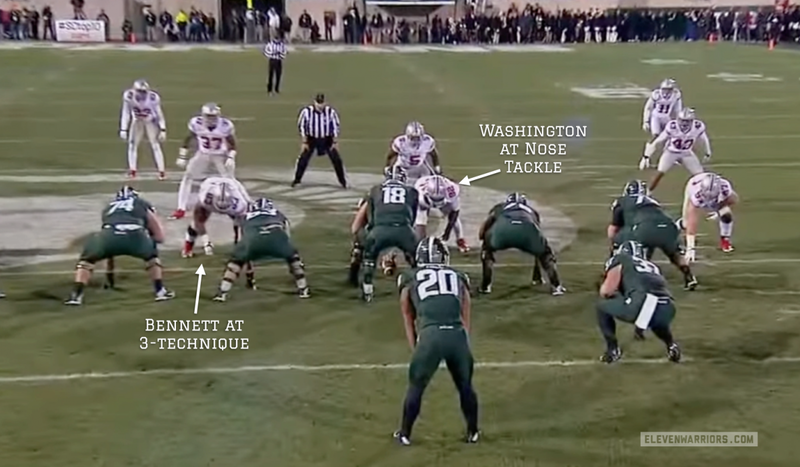 When the Buckeyes opened up on defense against Rutgers, many fans didn't notice the subtle change that had taken place, as Washington lined up at nose guard with Bennett back at his more natural position at the 3-technique. Though it would take a couple games for him to show it on the stat sheet, Bennett was back where he belonged. Now lining up in the "B gap" between a guard and tackle, Bennett was now often only facing one blocker instead of a consistent double-team, allowing him to use his quickness and excellent hand technique to penetrate the line and make plays in the backfield once again. The Centerville native made his presence felt most on the biggest stages, making two tackles in the Michigan State backfield during the crucial matchup in East Lansing. As the Spartans looked to run a counter play around the left side, Bennett easily uses a swim-move to get off the block of the left tackle, meeting the running back before he reaches the line of scrimmage. Though most casual fans think the nose guard spot is a more glamorous position due to their proximity to the ball and the notoriety that these monsters often receive thanks to their massive size, the 3-technique tackle is spot that produces more play makers. Players like Warren Sapp and Ndamukong Suh have created havoc from this position, using a mix of strength and quickness to overmatch opposing guards and tackles in one-on-one battles. Bennett would go on to dominate for the remainder of the year, especially as offenses game planned around stopping Bosa instead of him. Often running away from the star end, opponents found Bennett to be the one living in the backfield instead, which lead to 11 tackles-for-loss and six sacks in the back half of the Buckeyes' season. Beyond resurrecting Bennett's draft stock, the move solidified the OSU defensive front when it mattered the most. In what looked to be the stiffest test they faced yet against the nation's leading rusher, Melvin Gordon, Bennett couldn't be contained. Though the entire team appeared unstoppable that evening in the Big Ten Championship, Bennett was the anchor of the unit with 4 stops in the backfield and a pair of forced fumbles. Moving Bennett back to his natural position couldn't have been considered a success though, had it not been for the efforts of Washington. Though many had expected the junior from Cincinnati to have a career arc more resembling that of the younger Bosa, the Taft High School alum's work ethic and team-first attitude has often been overlooked. The Nose Guard spot in the Buckeye defense has long been a thankless one, with former players such as Garrett Goebel, Todd Denlinger, and others paying second fiddle while those around them earned all-conference or all-america honors. The top job of the player at that position is to occupy blockers, allowing the middle linebacker to run free without having to shake off an opposing blocker. Washington consistently filled this role admirably throughout the second half of the season, making it no coincidence that the play of Curtis Grant and Raekwon McMillan seemed to improve at the same time. Both "Mike" linebackers seemed to find themselves around the ball much more, often times getting there untouched. 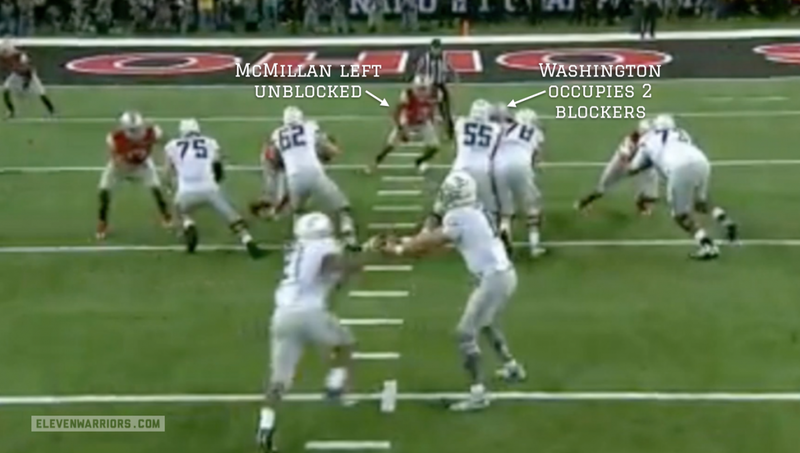 As we can see in this example from the National Championship against Oregon, Washington has both the center and guard engaged at the same time, working endlessly to split the pair. Though he'd never get close to the ball carrier, Washington has done his job perfectly. Neither offensive lineman is able to disengage and take on McMillan, allowing the linebacker to easily follow the play and make a stop at the line of scrimmage. While Washington undoubtedly has a future in the NFL, it's probably not at the nose guard position. However, showing the selflessness and ability to play three different spots on the line will pay dividends a year from now when he goes through the formal draft evaluation process. He also leaves Johnson, Ash, and Fickell with a great problem to have: where is his best position? Whatever they ultimately decide, the contributions he made this year were crucial for the Buckeyes' success. While the Buckeyes were able to counter the loss of Spence against the run, replacing his presence when rushing the passer proved far more difficult. Though Bosa seemed unstoppable during the first month of the season, offenses began sliding protection schemes in his direction, ensuring two blockers were often responsible for keeping him from reaching their quarterback in clear passing situations. 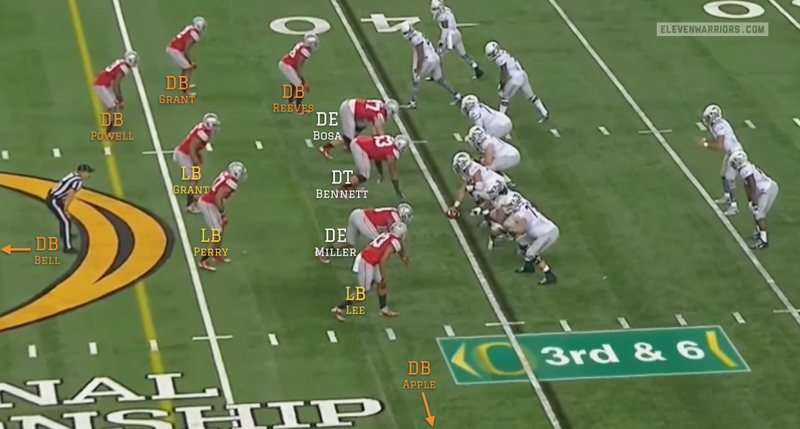 At the same time, Darron Lee had become perhaps the most valuable member of the Buckeye defense as a whole, making play after play for the Silver Bullets. But when facing clear passing situations, Lee, the "Sam" linebacker, was often taken off the field in favor of a third cornerback, Armani Reeves. As a redshirt freshman making the transition from high school quarterback to college linebacker, the staff didn't seem comfortable moving Lee to another spot in place of upperclassmen Curtis Grant and Josh Perry on third downs, no matter how well he had played up to that point. After seeing Lee take down the quarterback against Kent State and Rutgers when coming on the blitz though, the Buckeye coaches decided to try something new the following week against Penn State. 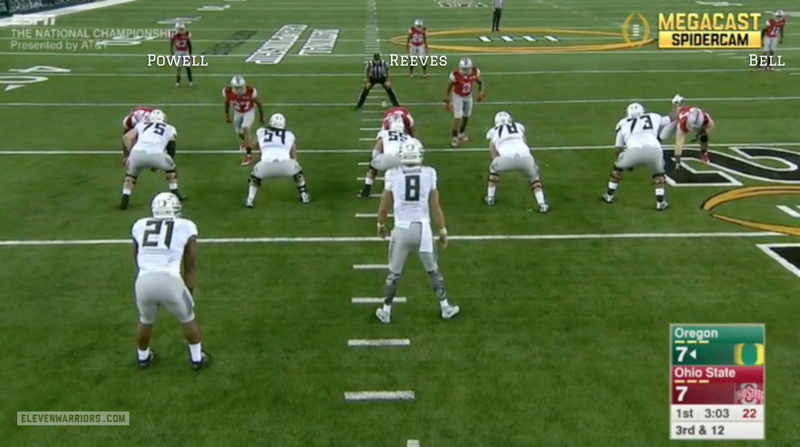 Instead of removing Lee in place of Reeves, which had amounted to a simple substitution, the Buckeyes would change their Nickel package entirely, replacing a defensive tackle with Reeves and lining up in a 3-3-5 alignment. The change paid off immediately, as Lee often lined up as a defensive end against the Nittany Lions, recording one sack by himself and sharing another. Lee's speed proved too much for many opposing offensive tackles, who would allow the New Albany native to record 5.5 sacks after the switch was made. But the switch to the the 3-3-5 did more than give OSU another speed rusher. It also allowed the unit to become much more diverse in their blitzing and coverage schemes. Bosa was now free to line up all over, sometimes even as a stand-up linebacker behind the nose guard while Lee lined up at left end, Bosa's traditional spot. All of a sudden, offenses couldn't double-team Bosa as easily. If they tried, Ash and Fickell would use this aggressiveness against them, using him as a decoy to free up blitzing linebackers. On the back end, the Buckeyes began experimenting with different looks, including a 3-deep safety look with Reeves lining up in the deep middle between Tyvis Powell and Vonn Bell. Thanks to Lee's natural athleticism, Ash could also play him as a zone defender on the outside and giving the offense eight zone defenders for the quarterback to read instead of the typical seven. But this didn't mean the Buckeyes would actually drop all eight defenders, instead often dropping seven and blitzing four. With only three down linemen though, it was up to the offense to figure out who that fourth man might be. The Buckeyes would eventually become a dangerous zone blitz team, dialing up pressure from all angles while still protecting themselves from getting beat deep thanks to the extra speed on the field. Ohio State would finish the season with 45 sacks on the season, seeing 13 different players taking down an opposing QB in the process. 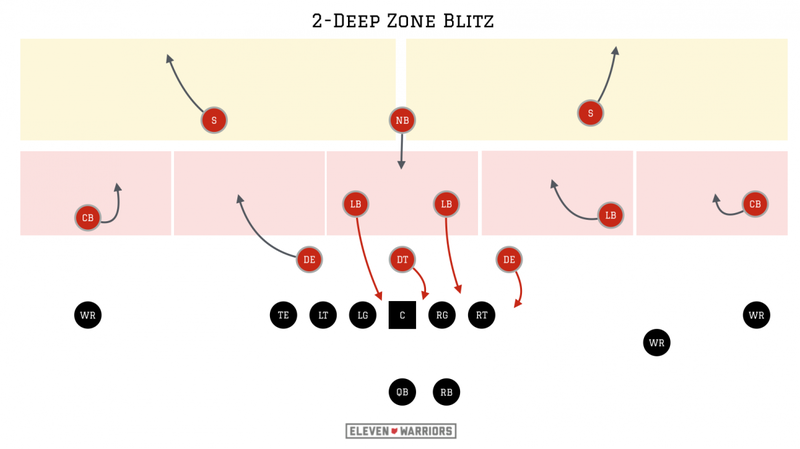 One such example was this particular zone blitz scheme that saw the Buckeyes drop only two deep safeties, while the middle safety and a defensive end each play one of the five short zones in this modified version of a "Cover 2" look. Four rushers come from the right side, two of which are the inside linebackers. OSU defenses have long featured the three-man front in nickel packages, so its inclusion in their game plans alone wasn't a surprise. However, the versatility that Lee brought to the table as both a pass rusher and in coverage allowed the Buckeyes to experiment with a number of schemes they may not have otherwise. From this look, the Buckeyes showed man-to-man coverage as well as two, three, and four-deep zones all with the same personnel. Though the OSU secondary regularly played their base, cover four defense on early downs, the ability to switch up on third downs was critical to their success. For the first time ever, opposing coaches had two extra games from which to identify tendencies. This has long been Ash's philosophy, trying to create chaos on third downs, with offenses never knowing the direction from which pressure will come while trying to identify the coverage. When implemented correctly, this approach can make life very difficult for opposing quarterbacks, even those that have won a Heisman trophy.